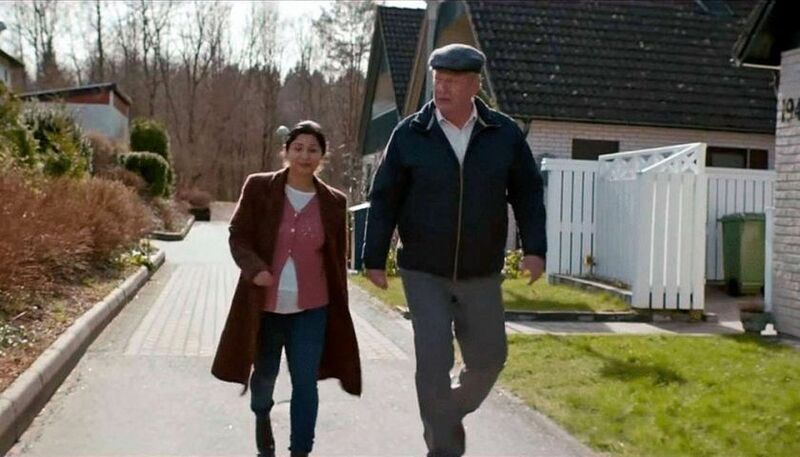 A Man Called Ove (En Man Som Heter Ove, 2015) is a Swedish comedy-drama that has achieved great popularity despite its main character being an incorrigible sourpuss . Written and directed by Hannes Holm and based closely on the 2012 best-selling novel of the same name by Fredrik Backman, the film was recently nominated for a US Academy of Awards Oscar as Best Foreign Language Film. his fussy enforcement of his gated-community residents association’s detailed, and largely ignored, rules. We see clearly early on that Ove is a curmudgeon of the first order. He barks at everyone he meets and dismisses them all as “idiots”. Since there is nothing pleasurable for him in this world, he promises to his wife at her tombstone that he will be soon joining her in the afterlife. He intends to commit suicide. There follows a series of carefully prepared for but ultimately interrupted suicide attempts. 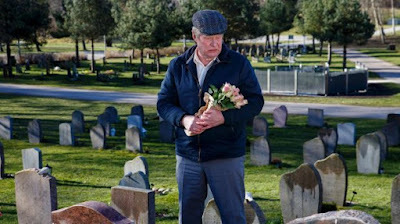 In each case the suicide is aborted by some interruption that evokes Ove’s punctilious sense of duty – even though he is in the process of leaving this world, he still feels obligated to attend to some detail in the here and now . Also, during several of these suicide attempts, Ove lapses into a recollection of his past that reveals to the viewer a more humane, earlier version of himself. So the suicide motif serves two functions in this story – as a comedic instrument and as a narrative trigger mechanism for revelations about Ove’s past. Ove’s first suicide attempt involves hanging himself with a rope tied to a hook in the ceiling. But this is interrupted when he looks out his window and sees new neighbors backing a trailer truck along the community sidewalk, a clear violation of resident association rules. 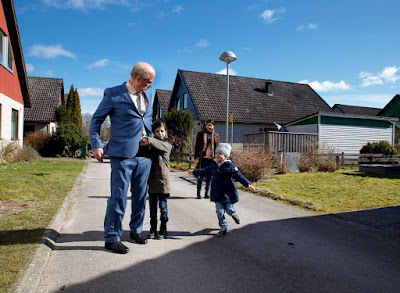 He stomps outside and meets the new family, which consists of a pregnant Iranian lady, Parvaneh (Bahar Pars), along with her klutzy Swedish husband and their two young daughters. Parvaneh is vivacious and highly sociable, the very opposite of the taciturn and eternally resentful Ove, and she becomes a key counterbalance to his doleful personage in this story. During Ove’s second suicide attempt, again by hanging from the ceiling hook, Ove lapses into a memory of his childhood. His mother died when he was a small boy, and he lived alone with his taciturn and reclusive father, who worked for the railway and who preferred tending to machines than spending time with people. While Ove was still a teenager (played by Filip Berg), his father was run over and killed by a railway car leaving him alone in the world. But his father’s ways left their mark on Ove. Machines were reliable, his father always claimed, and they did what was expected of them if they were properly maintained. This apparently became Ove’s credo, too, and he developed a mechanical view of the way the world works – everything and everyone should operate according to well-defined and mechanical rules. There was no accommodation in his scheme of things for human caprice, the kind of thing embodied by Parvaneh. In fact these two opposing perspectives – Ove’s mechanical rule-based way versus Parvaneh’s vivacious human-involvement way – turn out to be the central theme of this tale. But returning to the present, Ove’s second suicide attempt comes to naught when his rope breaks. This leads Ove to complain bitterly to the saleslady at the store from which he had purchased the rope that the rope had not been made properly. The next suicide attempt involves carbon monoxide poisoning in a closed garage, and its occasion launches Ove into another flashback when, as a young man, his family house was condemned by officious governmental “white shirts”, who claimed his house didsn’t meet official standards. 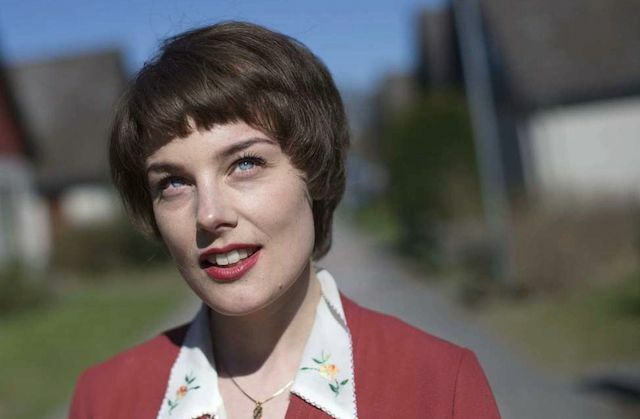 These “white shirts” point to a secondary and underlying subtheme in the film, an issue that likely comes up more often in countries like Sweden where the government makes a substantial commitment to social welfare. While that commitment is undoubtedly good, there may be associated intrusive governmental activities implemented that are intended to ensure that the desired social welfare is achieved. And in this connection there can arise exploitative people who use the government to coercively interfere with ordinary people’s live in order to siphon off public funds for their own profit. These are the kind of people called “white shirts” by Ove, and we see a few such people in this story. Continuing with this flashback, a neighbor’s house goes up in flames, and Ove, responding to his innate sense of duty, charges into the inferno and rescues two people. But his own house, due probably to the complicity of some “white shirts”, burns down, too. So, now without a home, Ove took to sleeping in empty railway cars, and one time when he overslept led to his meeting the beautiful woman, Sonja (Ida Engvoll), who would eventually become his wife. Sonja is charming and outgoing, and she practically has to seduce the shy, introverted Ove, herself, in order to stop him from lecturing her about how machines work and get him to propose to her. Why such a beautiful woman would be attracted to such a nerd as Ove is rather puzzling, but maybe that’s how things work in Sweden. 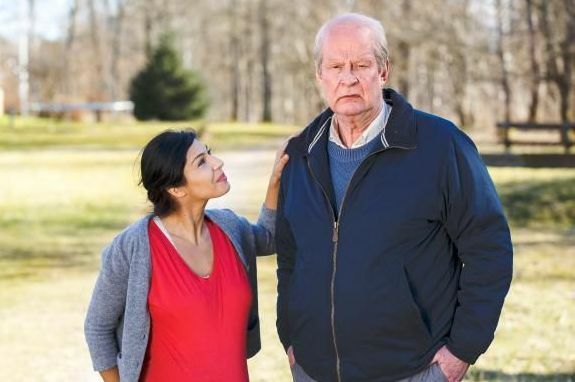 Returning to the present again, this suicide attempt is interrupted when Parvaneh bangs on the garage door and asks Ove for some driving lessons. Ove’s sense of duty obligates him to help her. While driving with her, he tells her about his long, and perhaps only, adult friendship with a similarly mechanically-oriented man named Rune, who teamed up with him in the running of the residents association. But there friendship was ruined, because Rune’s preference for Volvo motorcars conflicted with Ove’s preference for Saabs. This is another comic element that would probably mostly strike a chord with Swedish viewers. There are still more suicide attempts that come, though. On one occasion Ove intends to throw himself in front of an onrushing train. But this attempt is interrupted when he sees a man faint and fall onto the tracks; Ove’s sense of duty takes over, and he has to rescue the man. On another occasion he is about to blow his head off with a shotgun. But this is interrupted by a local teenage boy who has been thrown out of his home for coming out as a gay and is seeking a place to stay for the night. Again Ove’s sense of duty compels him to offer the boy a bed..
All the while, Ove is forced by circumstances and Parvaneh’s infectious insistence to have more interactions with the Persian woman and her homely concerns. She persuasively insists that he adopt a stray cat in the neighborhood that he used to angrily hiss at every time he saw it. And she also gets him to babysit for her two daughters while she is out. Before long her kids are calling Ove “grandpa”. Ove’s innate sense of duty even spurs him to come to the aid of his former friend Rune. Rune had recently suffered a stroke and was now paralyzed at home and tended to by his loyal wife. But “white shirts” from a greedy rest home had now intervened with a government order to seize Rune and have him placed under their care. However, Ove, with some outside help, manages to fend off the “white shirts” and enable Rune’s wife to keep her husband in her care. 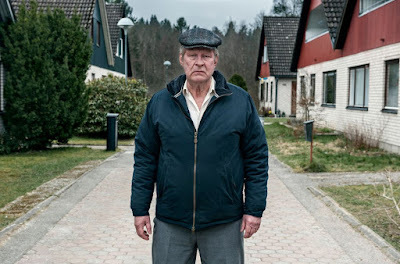 From my perspective, A Man Called Ove compares unfavorably to Bergman’s films. Although Bergman often has a despairing male figure who may be touched by a woman’s loving nature, he does open the viewer up to the existential loneliness of the man. We can empathize with this man’s angst. But Hannes Holm’s Ove is largely closed up and only seen from the outside as a curmudgeon. We are less drawn into an empathetic feeling for the man, and his suicide attempts are only played for laughs. So Bergman’s films have more depth. Similarly, on the theme of redemption, A Man Called Ove doesn’t measure up to Goodbye, Mr. Chips. In that earlier film, the stiff young schoolteacher Charles Chipping is brought out of his shell by his loving wife, Kathy. Her love lastingly opens up his heart and redeems him. In contrast, the two warm-hearted women in Ove’s life, his wife Sonja and Parvaneh, don’t really open him up and change him that much. All they do is manage to point Ove’s compulsive sense of duty in various fruitful directions that appear to them. But Ove, even to the very end of the story, remains his curmudgeonly self. So I don’t feel Ove ever finds redemption in the way Charles Chipping did in Goodbye, Mr. Chips. Still, it’s nice to see Ove at the end of the film sleeping in his bed, with the once-despised stray cat lying next to him. Alissa Simon, “Film Review: ‘A Man Called Ove’”, Variety, (8 March 2016). Keith Watson, “A Man Called Ove”, Slant, (26 September 2016).